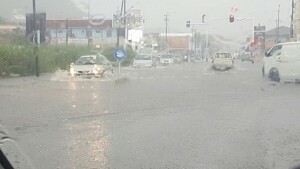 WILLEMSTAD – The Ministry of Public Works advises all those residents that live or has businesses in areas that are at risk of flooding, to take all possible measures to safeguard their property. One of the measures that the residents could take is to place sandbags in front of the doors of their houses or businesses. It is also advised to find another place to stay. Maybe at a family’s house or in one of the shelters. The government is taking all measures possible to alleviate the effects of the storm, but the island has its areas that are vulnerable to floods. The government cannot do much in the short term. Those who live of have business in the vicinity of Beurs, Goetoeweg, Versuviusweg, Penstraat, Oranjestraat, Julianaplein, Pietermaai, Kaya Jongewacht, Concordiastraat, Punda, Kanga/Dein and Stenen Koraal are at risk of flood. The Ministry of Public Works continues to clean the drainage system, especially in these areas.